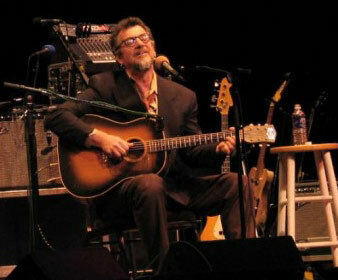 An unpretentious, compelling, and humorous performer with a dark, rich, idiosyncratic voice, Greg Brown is, hands down, one of America’s great singer-songwriters. His insightful lyrics paint powerful and often deceptively simple images on a canvas of gospel, blues, country, rock, and jazz. Everyone from Willie Nelson to Carlos Santana has covered his songs. At the personal request of Jeff Bridges, Brown contributed songs for Bridges’ Oscar-winning role in the film Crazy Heart. The son of a guitar-playing poet and a banjo-picking Pentecostal preacher, he was born in the Hacklebarney section of southeastern Iowa. At age 10 he found a Big Bill Broonzy album in Kansas, and his fate was sealed. Years later, he landed a job running hootenannies at Gerdes Folk City in the Village. Over the past quarter century he has recorded two dozen critically acclaimed discs and earned his way into the most prestigious theaters and festivals throughout the country. His latest album is Hymns to What Is Left.